The end of our calendar year is marked with meaningful holidays for Christians. We know our hearts should be filled with thanksgiving and celebration as we remember the coming birth of our Savior. But what if that's not how the holiday season plays out? With so many Christmas parties, dinner preparations, additional events, and gift shopping, the joy of the holiday season can be drowned out by stress. Take an afternoon off this week to refocus. Allow it to be a time of reflection and communion with God. 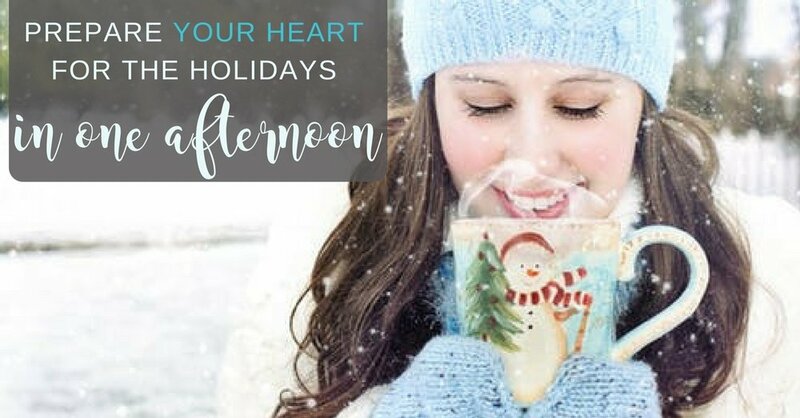 Grab your favorite holiday drink and find a quiet place to take a breather. Just sit in quiet for a moment. Take some deep breaths. They'll do wonders. Reflect on Jesus, the true reason for the season. Google a quick holiday devotional for help. No matter what life looks like right now, choose to pause and give thanks. Make a list of everything you are thankful for - a list on paper, not just in your head. Start with thanking Jesus for coming to this earth and ultimately dying for your sins. Thank Him for each blessing in your home, place of work, and community. Allow this season to drive you to God's Word. Don't become too busy for the Bible. Read the story of Jesus' birth in Luke 1-2 or reflect on Bible verses that prophecy the coming of Jesus. Tell me, how do you stay focused on Christ during the Thanksgiving and Christmas season? How do you keep yourself from getting lost in gift giving and holiday parties? Share your tips in the comments below. PLUS: Stay tuned for the "Christ in Christmas" Bible Challenge on this very page in December. You'll love it! May God bless you with an afternoon of refocusing on Him this very week!